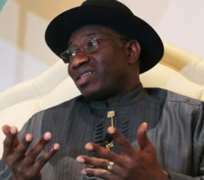 As the meeting between President Goodluck Jonathan and the aggrieved G-7 governors and other leaders of the Abubakar Kawu Baraje faction of the Peoples Democratic Party, PDP, got underway last night to resolve the crisis in the party, there were indications that the nPDP may have adjusted its earlier demand that President Goodluck Jonathan should not seek a second term in office. This came as the National Chairman of the party, Alhaji Bamanga Tukur has appealed to leaders of the new PDP to embrace dialogue saying the problem can be resolved in a family way. The governors who were present at the meeting with President Jonathan which began at about 3.30 pm at the first Lady's conference room, yesterday, were Rotimi Amaechi (Rivers), Babangida Aliyu (Niger), Sule Lamido (Jigawa), Abdulfattah Ahmed (Kwara) Murtala Nyako (Adamawa), Ibrahim Shema (Katsina), Ibrahim Dankwambo (Gombe), Liyel Imoke (Cross River) and Idris Wada (Kogi). As usual, the meeting which was earlier scheduled for the presidential villa at 9.00pm Sunday was closed to journalists. Sources among the governors at the meeting disclosed at the weekend that in the place of the earlier demand that President Jonathan should not seek re-election, the nPDP was last night set to demand that he gives practical and irrevocable evidence of allowing due process in the nomination process for the party's 2015 presidential candidate. Top of the evidence, it was learnt, is the sack of Alhaji Bamanga Tukur as national chairman and restoration of party executives in Adamawa and Rivers states. The G7 governors and their associates in the preparatory meeting at Baraje's house rehearsed strategies on how to approach the meeting with the president and the faction led by Tukur especially on the crucial demand that the president reveal whether he would run or not in the 2015 contest. 'This is not about 2015, but we want the president to provide clear guarantees that due process would be allowed to prevail in the party in all matters relating to the party and also the presidential contest,' one of the governors in the forefront of the nPDP told Vanguard. Appealing to the leaders of the new PDP, in a statement signed, yesterday, by the PDP National Publicity Secretary, Chief Olisa Metuh, the National Chairman, urged the seven aggrieved governors and other members of the nPDP not to play into the hands of those who hate Nigeria and the nation's democracy. Metuh said: 'The Peoples Democratic Party has urged all its estranged members to fully utilize the window of dialogue and reconciliation offered it and avoid playing into the hands of those who do not wish the nation or her democracy well. 'The party also said the on-going muted skirmishes and well organized theatrics aimed at portraying the President in bad light were not necessary because as members of one big family, no challenge was insurmountable. 'Very unfortunately, the easiest way to gain prominence today is to attack the President and the leadership of his party, not on issues of governance or on alternative direction of governance but on the pedestrian that borders on sheer mudslinging. 'While the inconsequential makes the banner, the essentials and the substantial in the consistent though quiet transformation of the nation are tucked away in obscure riders. The media are critical building block of democracy and the Nigerian media have stood firm across the decades. It must not relent.